Brooklyn | Beer Apprentice - Craft Beer News, Reviews, Interviews and Info. Time for another craft beer review guys. 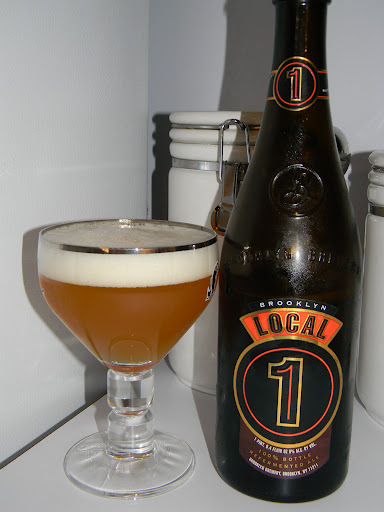 For today’s review I’m going to be trying the Local 1 produced by the Brooklyn Brewery located in Brooklyn, New York. The Brooklyn Brewery continues to churn out solid brews and, unfortunately, I have only had this brew once before (from a shared bottle), so I’m really eager about giving it a go and giving it a proper review. The Local 1 has an ABV of 9.0% and it comes in a 25.4 oz. bottle. Poured into a chalice, this brew showed a hazy, orangish to yellow color. A white head of very nice size was produced from a medium aggressive pour. The collar was soft, smooth and kind of creamy. The retention time was good and the lacing looked great. It really hung onto the sides of the glass. After it settled, a thin film stuck around on top of the liquid for most of the drink. Also, the foam was easily regenerated with a quick swirl. The nose was very yeasty and very bready. It smelled similar to sour dough bread actually. It was quite earthy and herbal too. Spices of clove mixed with bits of pear and banana. It also had a smell reminiscent of vanilla wafers. Only the smallest amount of alcohol was detected deep within the aroma. This bouquet was super well balanced, even and round. I thought this was a beautiful smelling beer. The taste brought forth more yeast and breads. Spices of cloves and pepper and maybe even a bit of coriander. Again, touches of pear and banana along with some sweet candied sugars. It seemed to be a tad musty and herbal, but that only complimented the overall seasoning. Like the fragrance, the taste was very well balanced with little to no alcohol present. An extremely nice flavor in my opinion. The mouthfeel was medium bodied, smooth and quite creamy. It was rather dry and a touch chewy as well. The carbonation was of medium standing and a small amount of warmth was felt from both the spices and the alcohol. A decent amount of flavor was left covering the roof of the mouth and the tongue after each sip. Well, we have a very, very good beer right here. When I sampled this brew before, it was good, however I think this bottle, which had about 1 year of age on it, is much better. It seemed to be a lot smoother, round and “calmed down”. The drinkability is much better now too. It has really developed into a wonderful beer that could be enjoyed year round. I do believe that this is now one of my favorite beverages produced by the Brooklyn Brewery. I would highly suggest that you give the Local 1 a try if you have yet to do so. It’s a treat to drink that’s for sure. Be sure to let me know what you think when you try it too. Thanks for reading and commenting everyone. Remember to look me up on Twitter (@BeerApprentice) and/or on Google+ (Scott Shrewsberry) if you’d like. I’d really enjoy the interaction. Thanks for checking in on another craft beer review guys. For today’s review I’m going to be trying the Sorachi Ace produced by the Brooklyn Brewery located in Brooklyn, New York. I’ve heard many good things about this beer, so I figured it was about time for me to find out for myself. The website, brooklynbrewery.com, has this to say about the Sorachi Ace. The unique flavor of Sorachi Ace was bypassed by the big brewers, but we thought it was pretty cool. So we made a special beer with it, and added the beer to our Brewmaster’s Reserve special draft beer program last year. Most Brewmaster’s Reserve beers are only available for a short time, and then they’re gone. But we liked this one so much, we decided to bring it back and give it the star treatment. Brooklyn Sorachi Ace is a classic saison, a cracklingly dry, hoppy unfiltered golden farmhouse ale, but made entirely with now-rare Sorachi Ace hops grown by a single farm in Oregon. We ferment it with our special Belgian ale strain, and then add more Sorachi Ace hops post-fermentation. After the dry-hopping, the beer emerges with a bright spicy lemongrass / lemon zest aroma backed by a wonderfully clean malt flavor. A bit lengthy, but well said. This brew had an ABV of 7.6% and it came in a 25.4 oz., caged and corked bottle. It poured a hazy, golden to yellow color. A bright white head was formed from a relatively easy pour. It was smooth, rocky and somewhat soapy in texture. The retention time was excellent and the lacing was very satisfying. Once it did settle, a smooth, thin film was left on top for the remainder of the drink. Just a beautiful looking beer. The aroma brought forth hints of lemon zest and lemongrass. It was floral and bright with just a very, very slight note of fresh cut red cedar. Very appealing. A little bit of “funkiness” was noticed, but it wasn’t overpowering or anything. It sat right in the middle and melded well with the other aromas. It also presented tones of spice and enough bready and yeasty characteristics to “round off” and balance the overall bouquet. It smelled great. The taste conceded a touch more of the funk than did the aroma. Additional hints of lemon grass, but also a tiny savor of fruity pear. A light tartness coupled with a nice hop character and a slight bitterness added even more complexity. A spiciness of freshly cracked pepper intertwined with a toasted biscuit taste, which in turn brought forth an herbal flavor that couldn’t be denied. Very tasty I thought. The mouthfeel was medium bodied with the carbonation leaning toward the “bright” side. It was dry, snappy, clean, crisp and refreshing. It was relatively smooth too. As the brew crossed the palate plenty of flavor was splashed on the tongue and roof of the mouth to indulge me for a great long while. Man, this is a great beer. I loved it. I found it to be exceptional in all categories. It looked great, had a great smell, wonderful taste and a more than suitable mouthfeel. It only got better as I continued to drink it. As a matter of fact I was a bit sad when it was all gone. To top it all off, the drinkability was outstanding. I would definitely recommend that you give the Sorachi Ace a try if you haven’t done so. I know I will be picking up another bottle sometime very soon. I think it goes well with just about anytime of the year too and not just Summer. Even though it would go great during those warmer months around the BBQ that’s for sure. 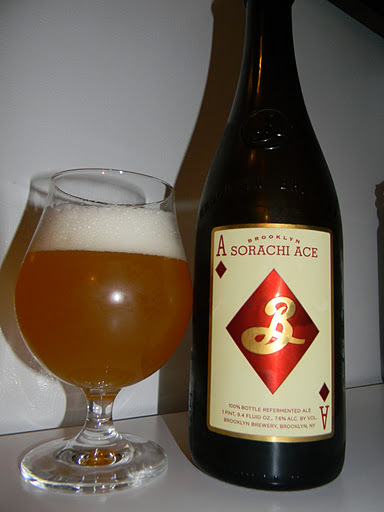 The Brooklyn Sorachi Ace is a winner in my book and it’s a beer that I won’t soon forget. If you’ve had the Sorachi Ace before, what did you think of it? Feel free to leave a comment and tell me about it. Thanks for reading folks. Until next time. For today’s craft beer review I’m going to be trying the Schneider-Weisse/Brooklyner Hopfen-Weisse brewed in a collaboration effort between Weisses Brauhaus G. Schneider & Sohn GmbH located in Kelheim, Germany and the Brooklyn Brewery located in Brooklyn, New York. I don’t know much about this beer and I couldn’t find any information on this particular brew from either schneider-weisse.de or brooklynbrewery.com, so I’m going to be reverting back to ratebeer.com for some content. Sounds enticing. I can’t wait to try it. This beer comes in a 16.9 oz. bottle and it has an ABV of 8.2%. It poured an extremely cloudy/hazy, dark orange to almost “muddy” water color. Chunks of sediment were floating about. The cap was off white in color, mostly creamy and fluffy. The size was “ok”, the retention time was good and the lacing was adequate. The aroma of this beer was quite unique I thought. Floral smelling with hints of fruity apples, peach and grapefruit, which brought forth a nice, hoppy profile that was intermingled with a spice of clove, some ripe bananas, wheat and yeast. Very cool. I liked it. It had that whole “push/pull” thing going on. As the brew warmed it started to become very herbal and earthy also. Very nicely balanced, sturdy and precise. The taste divulged a juicy-fruit gum aspect. Apples and peaches mostly with a slight touch of apricot. Wheat and toasted bread crusts coalesced with spices of pepper and clove. It presented a very nice hop bite and bitterness as well as a little “kick” at the back end from the spices. Only a trace of alcohol was noticed on the swallow. Again, very earthy and herbal to finish it off. The mouthfeel was very distinctive and complex. Medium bodied, dry, smooth, crisp and thirst quenching. It was somewhat creamy and chewy too with a good amount of carbonation. A slight touch of warmth reminded me that it was 8.2% ABV and enough flavor was left on the palate for me to ponder between sips. This was a very “cool” little brew right here. 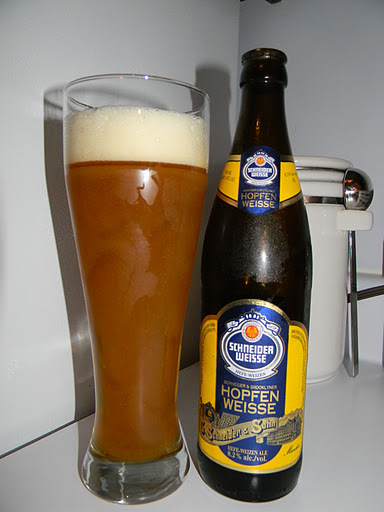 I loved the interaction between the hops and the Weizen characteristics. It was super easy to drink too considering the rather high ABV. I definitely think this beer is worth a try if you have not done so. I know I wouldn’t mind having another one, especially when the weather starts to warm. It was fairly robust and sturdy with plenty of complexity for discussion. This was the first time that I’ve ever had a beer like this. I would really like to seek out others of this style and see how they compare. With that being said, if you stumble across the Schneider-Weisse/Brooklyner Hopfen-Weisse somewhere, pick it up. I think you may enjoy it.